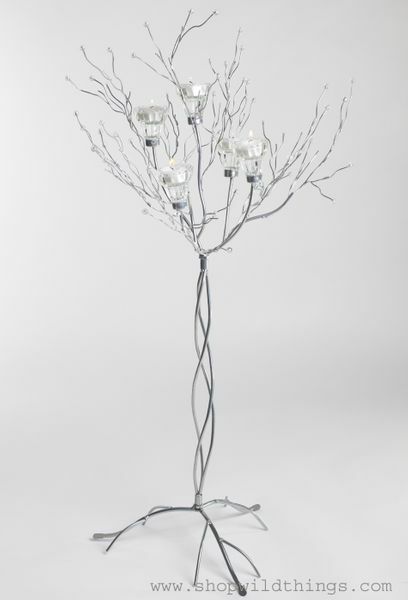 This beautiful silver candle tree is perfect for so very many applications! Would be stunning on a mantle or hearth, as a table centerpiece (hang strands of beads or crystals down it too! )...or in that blank spot where you just need SOMETHING fabulous! The candle cups will hold: tea light candles, votive candles, or taper candles! Branches are bendable for perfect positioning. The base is pretty enough to forego draping, and the twisted trunk gives it an extra touch of class. Note: Please be careful when bending out the branches, they can break off the stems if not handled carefully. Height approximately 36" (depending on how the branches are spread out) Width of Base 11.5" Branch Spread 18-20"
I got 6 of these to use on half of my reception tables (used sets of vases filled with Christmas ornaments on the other 6 tables). They were perfect, I got endless compliments! I highly recommend these! I used LED lights flipped with the bulb down and it created a beautiful effect and just glowed when it got darker. This is super-easy to assemble. It is so pretty, even my husband liked it. 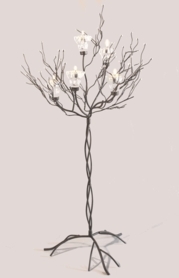 The branches are quite flexible, and the candle holders will hold tealights or tapers- or even a flower bud. This was a gift (which she ADORED!) but I will be getting myself one similar to this.